Eggerichs maintains that the key here is that women are built to love naturally, so they need to work on respecting their husbands unconditionally, and conversely that men are built to respect naturally, so their focus should be in loving unconditionally. Being a man, and married for ten years, I can say it is not my first inclination to buy self-help books on marriage. However, I am very glad I chose this book to review. What helped me most is Eggerichs’s point that the person I am married to loves me, and though I oft misinterpret her, or fail to understand her viewpoint, she does mean well. Also the appendices in the book are helpful with ideas that you can use to reinforce the lessons from the book. One thing I didn’t care for is the amount of testimonials in the book. It felt almost like an infomercial at times, and I found myself skimming through them. Thank you Thomas Nelson for allowing me to blog-review this. 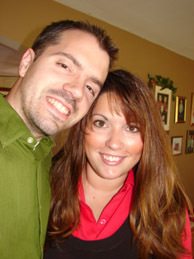 This past Thursday, March 13 2007, Bethany and I celebrated our ninth year of marriage! It was a beautiful, cold March day when we were married. Bethany had just turned 18, and I was barely 21. Many people I am sure uttered the words, “They’re too young. They’ll never make it.” Ha! I laugh in your faces! Not only are we still married, we’re happy and LOVING it! The U.S. Census Bureau released a report in 2005 stating that the average first-time marriage lasts 8 years. According to that statistic, we are BETTER THAN AVERAGE! I could have told you that, but it’s nice to back it up with some facts. It’s been a great nine years, even though the first was quite rough. We have four children ages 6, 4, 2, 1, and number five due in September. I love ‘em, I love ‘em, I love ‘em. So, to encourage all you you married people, if we can do it, anyone can. And it’s not about you, it’s about both of you. As for words to live by, I can only speak from the husband perspective. The Bible says to love your wife as Christ loves the church (Eph. 5:25). He laid down His life for us, so give your life for her. He had no complaints, even though He knew it would be tough, and He still gave his life knowing He might never receive anything in return, so quit your complaining and help her out once in awhile. Also, 1 Corinthians 13 is a great place to learn about love as well.